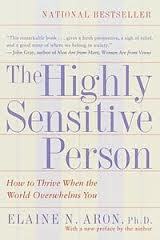 Highly Sensitive People: Not Your Grandmother’s Introvert! In her national bestseller, The Highly Sensitive Person: How to Thrive When the World Overwhelms You, author Elaine Aron defines a distinct personality trait that affects as many as one out of every five people. According to Dr. Aron’s definition, the Highly Sensitive Person (HSP) has a sensitive nervous system, is aware of subtleties in his/her surroundings, and is more easily overwhelmed when in a highly stimulating environment. Another cause for Aron and her fellow HSPs to celebrate is the acceptance into mainstream psychology of the HSP personality trait. After numerous in-depth interviews, as well as surveys of over one thousand people, Dr. Aron’s findings have been published in Counseling Today, Counseling and Human Development, and the prestigious Journal of Personality and Social Psychology. Elaine Aron has a doctoral degree in clinical psychology and a thriving psychotherapy practice. She is the first therapist to tell HSPs how to identify their trait and make the most of it in everyday situations. – a normal occurrence, according to Aron. “About 15 to 20 percent of the population have this trait. It means you are aware of subtleties in your surroundings, a great advantage in many situations. It also means you are more easily overwhelmed when you have been out in a highly stimulating environment for too long, bombarded by sights and sounds until you are exhausted.” An HSP herself, Aron reassures other Highly Sensitives that they are quite normal. Their trait is not a flaw or a syndrome, nor is it a reason to brag. It is an asset they can learn to use and protect. When you were a child, did your parents or teachers see you as sensitive or shy? HSPs have been called “shy,” “timid,” “inhibited,” or “introverted,” but these labels completely miss the nature of the trait. Thirty percent of HSPs are actually extroverts. HSPs only appear inhibited because they are so aware of all the possibilities in a situation. They pause before acting, reflecting on their past experiences. If these were mostly bad experiences, then yes, they will be truly shy. But in a culture that prefers confident, “bold” extroverts, it is harmful as well as mistaken to stigmatize all HSPs as shy when many are not. In the Highly Sensitive Person, Dr. Aron reframes these stereotyping words and their common application to the HSP in a more positive light and helps HSPs use and view these aspects of their personality as strengths rather than weaknesses. Sensitivity is anything but a flaw. Many HSPs are often unusually creative and productive workers, attentive and thoughtful partners, and intellectually gifted individuals. According to Dr. Aron, HSPs could contribute much more to society if they received the right kind of attention – and her national bestseller proves that this 15 to 20 percent of the population is eager to get off on the right foot in asserting their unique personality trait. Read more: There are many websites from both the medical and personal perspectives on HSP (including http://livingsamsara.com/) and of course Dr. Aron’s book is a classic. Marie is highly entertaining – and SMART! 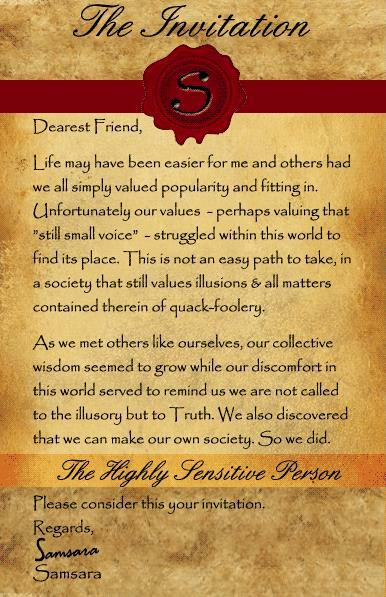 Comments Off on Highly Sensitive People: Not Your Grandmother’s Introvert! Counselling: Who Gets It? For What? Who Doesn’t? Why Not?